PrairiErth Farm is a 300 acre certified organic farm in Logan County, right in-between Chicago and St Louis. The farm has been owned by the Bishop family for over 30 years. Dave Bishop overseas the livestock and grain operations, while his son Hans and daughter in-law Katie, along with about 7-10 employees and apprentices, manage 15 acres of vegetables. Farmers markets make up about 50% of the farm’s revenue, with CSA and wholesale making up the rest. 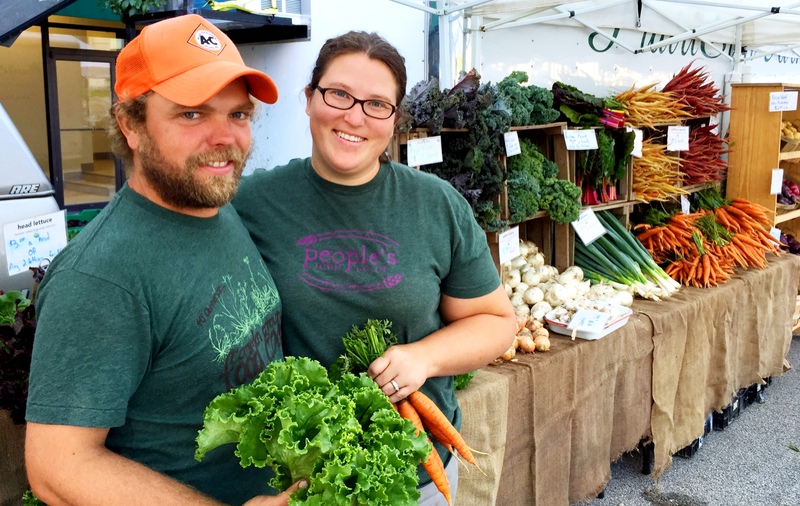 “We depend on farmers markets to keep our farm growing. While it’s a lot of work to harvest and staff the market, the interaction with our customers is invigorating. It’s where we’re able to build lasting relationships and connections. We know our customer’s names, their children’s names, their dog’s names. We know what vegetables they like or don’t like. It’s an amazing experience, and very fulfilling,” says Katie. A regular face at the Downtown Bloomington and ALMH farmers markets, Katie believes farmers markets open the family and farm up to the bigger community- forming friendships and other mutually benefiting relationships with other farms and small businesses. The support PrairiErth receives is then redistributed, giving back to the bigger picture.